Chosen by Peggy Sharp for the Resource Book for her 2005-2006 workshop for educators. "a great springboard for any author visit!" Years ago, I was invited to a friend's home to meet my first real live author. I went to the library to borrow the author's book, the librarian gave me a concerned look and said, "Oh, I hope you won't be disappointed. Authors are just ordinary people, you know." I wasn't disappointed, but when I became an author myself, I understood what that librarian meant. Authors are ordinary people who work hard at doing something they love. When I visit schools, I sometimes worry that my "ordinariness" will be a disappointment. 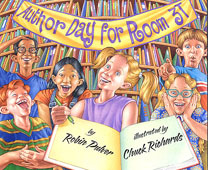 This silly story actually conveys information about authors. I'm sure it was also inspired by my deep admiration for Jane Goodall and her work with chimpanzees. Although Harry Bookman, the chimp, wears a "human" outfit, his actions are true to real chimp behavior.